A Somerset-based charity has paid tribute to its supporters after they managed to raise £60,000 for a new rescue hovercraft in just nine months. It will replace Burnham-on-Sea's Light Of Elizabeth, which rescued nine people last month at nearby Weston-super-Mare. The new Italian-designed hovercraft will be bigger and more versatile and identical to the model used by Gloucestershire Fire Brigade. Spokesman Mark Newman said donations had ranged from pennies to £10,000. He said: "In the midst of a recession, it is no mean feat to raise such a sum in nine months. It is testament to the generosity of Barb's [Burnham Area Rescue Boat] supporters. 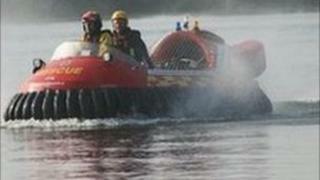 "The new hovercraft is made of Kevlar rather than fibreglass so is better suited to being used in corrosive salt water. "It's more manoeuvrable, stronger, slightly faster and can hold up to nine people." The hovercraft is expected to be in service in spring 2011.